First Lieutenant Fieldon B. Huie, Jr.
Fieldon B. Huie, Jr. was the first of three children of Fieldon B. Huie, Sr. and Lona Huie. He was born in Formosa, Arkansas. In the 1920s, his family moved to Morrilton, Arkansas, where he attended Morrilton High School and Harding College. Fieldon Huie, Jr. was 16 at the beginning of the Great Depression. Like many others in rural Arkansas during that time, he undertook multiple jobs. He worked as a local agent for the newspaper, Arkansas Democrat, as well as taking shifts at the Morrilton Cotton Mill, the Wythe Feed Mills, and the Topeka Flour Company. His father was a farmer in the 1920s, but he eventually became the manager of a feed store to make money for his family. Fieldon Huie, Jr. faced hardships early in his life. His brother Jack was killed in an automobile accident when Fieldon was 17 and his father died ten years later. 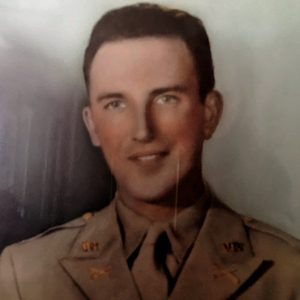 He graduated from Morrilton High School in 1931 and attended Harding College, where he became a second lieutenant in their Reserve Officer Training Corps (ROTC) program. 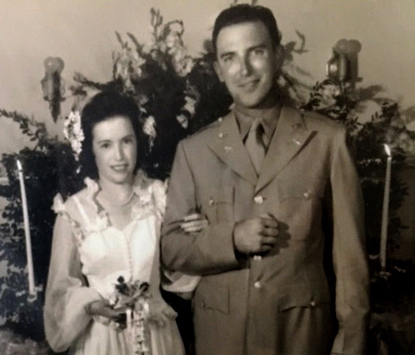 On August 7, 1943, Fieldon B. Huie, Jr. married Ruth Jumper in a simple ceremony at the Jumper household. Their newspaper wedding announcement stated that after the marriage, the two would live in Muskogee, Oklahoma, where Huie was stationed with the Rainbow Division at Camp Gruber. Before his deployment overseas in May 1944, he transferred to the 4th Infantry Division. Before 1941, Arkansas trained civilian pilots through a government-financed college program. After the start of the war, Arkansas developed several civilian and military pilot training facilities and air bases. This helped Arkansas during the war and assisted its economy after the war. Arkansas also opened six new military ordnance plants. Just before he joined the military, Huie worked at the Maumelle Ordnance Works between Little Rock and Conway, near his hometown of Morrilton. Officials determined that Arkansas possessed 17 of the critical and strategic war minerals listed by the Army and Navy Munitions Board. Bauxite, manganese, and cinnabar (mercury) would be the most important. Arkansas’ forests also provided lumber and paper products that were also essential to the war effort. Between 1942 and 1945, almost 16,000 Japanese Americans lived at two internment camps in Arkansas - Rohwer and Jerome. Many men in the camps chose to fight for the United States. Overall, 326 Japanese-American soldiers served in the 442nd Regimental Combat Team. One of the Rohwer enlistees, Ted Tanoye, was posthumously awarded the Medal of Honor for action in Italy. Over 23,000 German and Italian POWs were also relocated to prisoner of war camps in Arkansas, at Camp Chaffee, Camp Dermott, and Camp Robinson. The final type of camp was the only World War II era work camp in Arkansas established for religious conscientious objectors (COs). These men lived at Camp Magnolia and performed work much like the Civilian Conservation Corps, and took part in government medical experiments on diseases and malnutrition. The exchange of letters between soldiers and their families back home gave the soldiers a sense of normal life outside of the war. Despite the common belief that all letters to and from were love letters, a large majority discussed the weather or how the family was doing. Huie’s wife, Ruth, illustrated the simplicity of the writing topics in a letter to him. She wrote about working at the local shoe store, going to the show at night, or playing board games such as Pollyanna. It was obvious from her letters that writing those letters was comforting for both the soldiers and the families. When he entered the U.S. Army in September 1942, Huie trained at Camp Wolters, Texas, Fort Benning, Georgia, and at Camp Gruber, Oklahoma. He was stationed with the 42nd Infantry Division “Rainbow Division.” Before his deployment overseas in May 1944, he transferred to the 4th Infantry Division, also known as the Ivy Division, where he was assigned to Headquarters Company for Company B. After landing on D-Day, Huie and his men joined the rest of the VII Corps in fighting inland on their way to reclaim the port city of Cherbourg. Facing fierce resistance in Azeville, Fontenay, and Quinéville, Huie bravely led his men as his regiment progressed slowly across the Cotentin Peninsula. He was originally reported missing in action (MIA) on June 14, 1944, when his unit was fighting near Quinéville. When the 22nd Infantry reached Digosville, near Cherbourg, on June 23, 1944, the Germans had fortified the southern flank of the city. That day, the 22nd Infantry Regiment was ordered to attack westward. 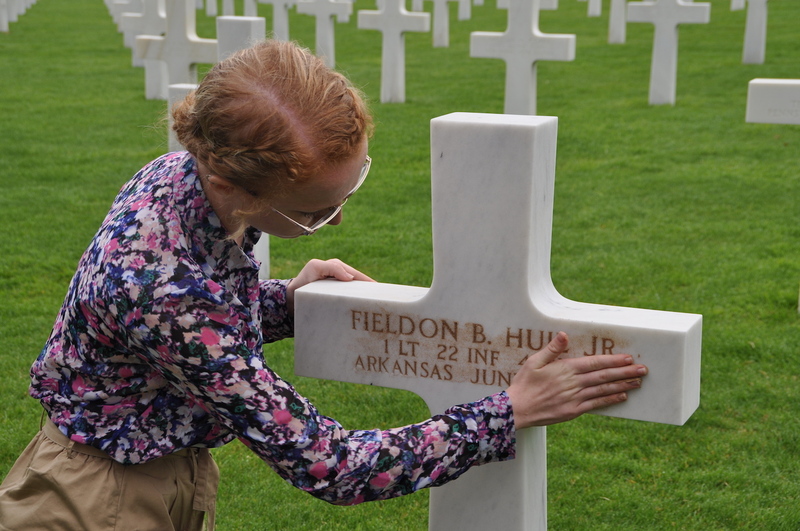 The same day, Fieldon B. Huie, Jr. was killed in action (KIA) while fighting courageously for his country. In one of her last letters to her husband, Ruth wrote, “Honey, just come back that’s all I’m asking. Anything else I can take as a soldier’s wife should. I’m depending on you so don’t fail me. I love you so that these next few months will just be wasted months because you are not around. The one consolation is they can be made up. All my love, Ruth.” Her words alone make the letter heartbreaking. But this letter was written on July 17, 1944, almost a month after his death in June. Huie was killed in action on June 23, 1944. 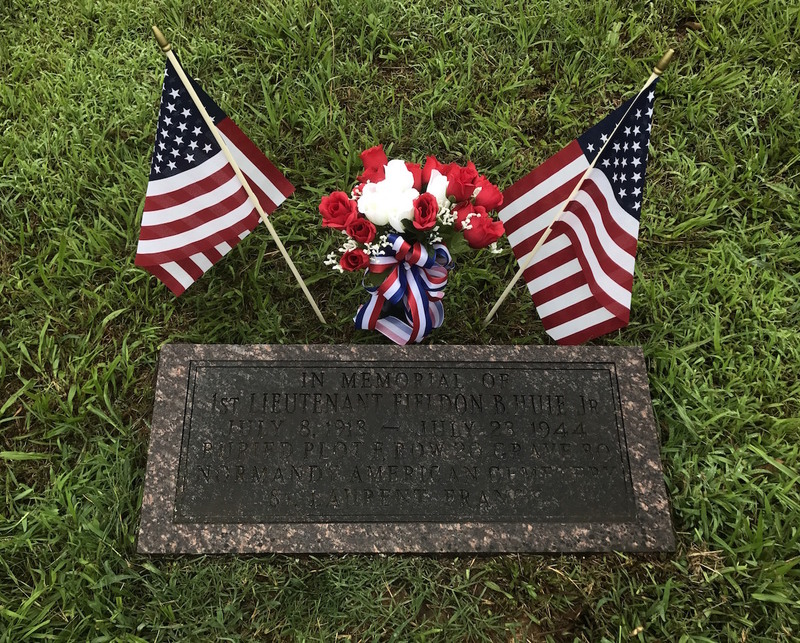 First Lieutenant Fieldon B. Huie, Jr. was reported missing in action on June 14, 1944 and soon deemed killed in action near Digosville, Normandy, while fighting courageously for his country on June 23, 1944. Huie died at the age of 30, which was not as young as some of the soldiers in the Normandy Invasion. However, just like them, Huie had plans for his future with his wife and his family. Their letters spoke about their plans when he came home, such as a honeymoon and Ruth learning to cook for him. These plans never came to be, due to Lieutenant Huie, Jr.’s sacrifice. It is a shame that some stories of soldiers’ lives before and during the war are now forgotten. While no one in his hometown recalled Lieutenant Fieldon B. Huie, Jr.’s story, his story will now be told. In the words of Harry S. Truman, “Our debt to the heroic men and valiant women in the service of our country can never be repaid. They have earned our undying gratitude. America will never forget their sacrifices.” People will soon be aware of the sacrifice of First Lieutenant Fieldon B. Huie, Jr. from Arkansas. The Normandy: Sacrifice for Freedom® Albert H. Small Student and Teacher Institute has helped me obtain a completely different view of history as a whole. The ability to see the exact locations where my Silent Hero died, as well as the locations where so many more fought, gave me a new perspective on the war itself that I could not have realized at this time last year. I know I will never truly understand what the soldiers encountered, but the Normandy Institute has given me an outlook that is unimaginable in a state such as Arkansas. Standing on Utah Beach, where my silent hero, First Lieutenant Fieldon B. Huie, Jr. first attacked with the 4th Infantry Division, has been a life-changing experience. I could stand there for days, but it will never be possible to truly imagine the noise and sights that a soldier experienced. I stood near the water and tried and tried to imagine the chaos, but realized it was impossible. Standing there, exactly where my Silent Hero and many other men with a multitude of different stories stood, that is when I began to see the history in a different way. Looking at pictures of war in textbooks can give someone an idea, but walking on the beaches, standing inside of the bunkers, or just seeing the hedgerows makes all of the stories come to life. Before departing for France, Mrs. Cline and I came in contact with some people who live in Morrilton, Arkansas, where Fieldon B. Huie, Jr. lived for many years. One woman in particular specialized in genealogy and told me about her trying to find a story behind my Silent Hero to add to the local museum, but she was sad to admit she found very little. I was at first very disappointed to hear they had almost no information regarding him or his past. Looking at it now, it will be such an honor to travel back to his hometown and tell the story she could not find through her personal research. The ability to bring a soldier’s story back to life is an amazing opportunity and I am so thankful to be able to do so. 22nd Infantry Regiment, 4th Infantry Division, January 1, 1944-February 29, 1944; World War II Operations Reports, 1941-1945, Records of the Adjutant General’s Office, 1917-, Record Group 407 (Box 5835); National Archives at College Park, College Park, MD. The Arkansas Gazette. “Huie-Jumper Marriage is Solemnized.” August 11, 1943. Arkansas. Conway County. 1930 U.S. Census. Digital Images. http://ancestry.com. Barnes, Cathy, ed. Siftings from the Morrilton Democrat Newspaper 1930 Published in Morrilton Arkansas. Conway: Arkansas Research, 1997. Fieldon B. Huie Jr., Individual Deceased Personnel File, Department of the Army. Letter from Ruth Huie to Fieldon B. Huie Jr., July 17, 1944. “Obituary of Fieldon Huie, Jr.” Ancestry. Last updated 2010. Accessed February 19, 2017. http://archiver.rootsweb.ancestry.com/th/read/ARCONWAY/2010-03/1269759119. Ruppenthal, Roland. 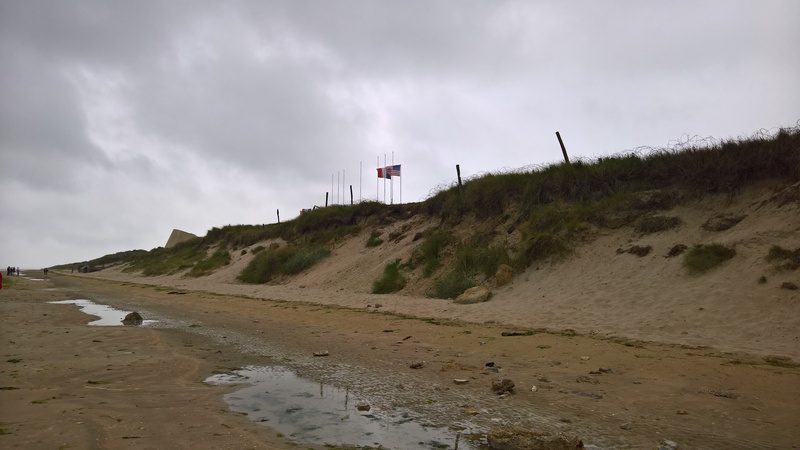 Utah Beach to Cherbourg. Washington D.C.: War Department Historical Division, 1948. Ste. Mere Eglise Military Cemetery No 1; Maps of Temporary American Grave Sites Overseas, 1946-1951, Records of the Quartermaster General, 1774-1985, Record Group 92; National Archives at College Park, College Park, MD. Bolton, S. Charles. “Turning Point: World War II and the Economic Development of Arkansas.” Arkansas Historical Quarterly, Summer 2002, 123-151. Hope, Holly. We’ve Gotta Get Tough: History of World War II Home Front Efforts in Arkansas, 1941-1946. Little Rock: Arkansas Historic Preservation Program, 2008. “Interment: Life Interrupted.” University of Arkansas Little Rock. Accessed March 5, 2017. https://ualrexhibits.org/lifeinterrupted/internment/. Kreider, Robert. “The Civilian Public Service Story.” Mennonite Central Committee. Last updated 2015. Accessed March 5, 2017. http://cps.peaceworks.ca/#Welcome. “Rohwer Japanese American Relocation Center.” Rohwer Heritage Site. Last updated 2017. Accessed March 5, 2017. http://rohwer.astate.edu/. Smith, C. Calvin. War and Wartime Changes. Fayetteville: The University of Arkansas Press, 1986. Whayne, Jeannie, Thomas Deblack, George Sabo III, and Morris Arnold. Arkansas: A Narrative History. Fayetteville: The University of Arkansas Press, 2013.